Many moons ago a friend introduced me to the world of Fallout and the “Vault Dweller”. Instantly I fell in love with the game. Then Fallout 2 came out and I loved it even more… Fallout Tactics arrived on shelves in 2001 and after some good reviews I ran to the store to get it only to be completely disappointed. 2004 Brotherhood of Steel was released. I rented it not knowing what to expect. I took it hope prepared for the worst and hoping for the best only to turn around and take it back the same afternoon. I began to think that this series would never actually see a proper and deserving sequel. Bethesda Softworks announced they would be taking over the license from the now defunct Interplay and I my interest was piqued knowing that they had a rich and successful background with the Elder Scrolls series on the PC. I hoped that they could restore the series to its former glory but wasn’t sure if they’d be able to resurrect it after the stream of crap that followed Fallout 2. Not to mention that I hated almost everything about Elder Scrolls 3 and 4 (with the exception to the size of the world in Elder Scrolls 4). As time went on, I found myself more and more intrigued and genuinely excited for the new Fallout 3 and in October when it came out I took the day off work to pick it up. Don't worry, there are no plot points revealed in this review so no spoiler warning is required. In the game you take on the roll of a Vault Dweller and start off literally as a newborn where you get to decide what your characters name is and his look. Here you pick from a variety of attributes which help to shape who you become. The game teaches you the basic mechanics of movement and shooting and thrusts you right into the action. As you level up you get to add points to your various attributes such as your ability to use big guns or even lock pick (a must have). After you achieve a new level, you’ll be faced with choosing Perks. Perks are little attributes that can give you a bonus to certain things such as radiation resistance or my personal favorite - “The Bloody Mess” Perk - which basically is what it sounds like. How messy your kills are. The graphics and size of the world are truly something to behold. For about an hour I found myself wandering around in awe much like the Vault Dweller would have been when he first set his gaze upon the Wastelands. After I ran into some random raiders and died I remembered the task at hand and I set about. Soon after I came to the realization how epic this game was truly going to be. You’re constantly faced with a variety of challenges of the moral kind and side quests that shape how people do or don’t react with you. I chose to be good at the beginning but for me it became increasingly harder to resist temptation to take a shotgun to the back of some poor unsuspecting merchants head, and eventually I caved. In the end I was labeled as the 'Harbinger of War' which restricted the conversations and quests that came later in the game. The look and feel is rather different from the ¾ overhead of the previous games for a first-person shooter look. They also changed the combat system. Not enough to say that they overhauled it so much as they tweaked it. Previous games had you in a turn based style combat with AP (Action Points) to move your player, reload guns and shoot. The AP system is back and integrated with the first-person shooter genre nicely in that you have AP for aimed hits (called VATS) or you can just go guns a blazing like the other cookie cutter shooter games. I recently finished the game and it only took me about 42hrs. I say only because I had a glance at the full game map and realized I miss out on quite a bit of the game. I immediately thought “damn. I’m gonna have to take another crack at this and see if I can get it done in less than 60hrs”. Allow me a moment here to say something personal to anyone at Bethesda who may be reading. Great article! I wasnt all that interested in checking it out for pretty much the same reasons in the article after Fallout 2. But any game that can add an extra 20 hours just running all the side quest sounds awesome to me. Im definitely going out to rent it and give it a shot. Hmm... good review. I might check this game out. I've never been a follower of the Fallout series but I think I'll check this one out. Refreshing to see such a positive review from a die-hard Fallout fan. 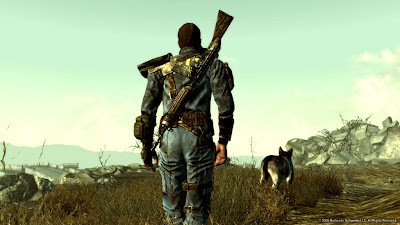 There is definitely a laundry list of gripes that can be levelled against Fallout 3 but it never diminishes the game's addictiveness and impressive attention to detail. For me, it shares a bit too much DNA with Oblivion in the way it handles the nuts n' bolts interactions such as inventory management, combat and conversations. Despite the flaws, I've been very engrossed in my game (I don't play a game for 70 hours and dislike it) and wouldn't be surprised if it takes GOTY come award season. I just picked up Fallout 3. I am so excited to start this adventure. This review really got me excited.